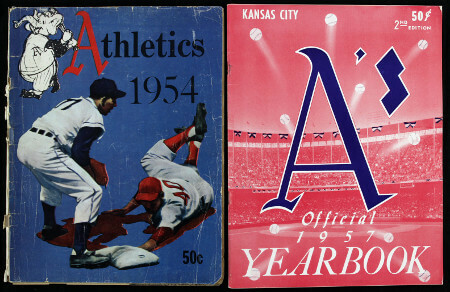 By the summer of 1954, it was obvious that the A’s were on an irreversible slide into bankruptcy. Earle and Roy decided that there was no choice but to sell their father’s beloved team, and it was with great sorrow that the old man gave his approval for the sale. Although several offers were put forward by Philadelphia interests, American League president Will Harridge was convinced that the team could never be viable in Philadelphia. The sparse crowds at Shibe had been a source of frustration for some time to the other AL owners, as they could not even begin to meet their expenses for trips to Philadelphia. As a result, Harridge had come to believe that the only way to resolve the “Philadelphia problem” was to move the Athletics elsewhere. For this reason, when Chicago businessman Arnold Johnson offered to buy the team, the other owners pressured Roy Mack to agree to the sale. Johnson had very close ties to the Yankees; he not only owned Yankee Stadium but also owned Blues Stadium in Kansas City, home to the Yankees’ top farm team. Johnson intended to move the A’s to a renovated Blues Stadium if he was cleared to buy them. The Yankees made no secret that they favored Johnson, and their backing gave him the upper hand with the other owners. After an October 12 owners meeting at which several offers from Philadelphia interests were rejected as inadequate (Harridge later said that while several of them “talked about millions”, they didn’t have any money behind them), Mack agreed in principle to sell the A’s to Johnson no later than October 18. However, on October 17, Roy Mack suddenly announced that the A’s had been sold to a Philadelphia-based group headed by auto dealer John Crisconi. The deal was to be approved at an American League owners’ meeting on October 28. It looked headed for approval when rumors (reportedly planted by the Yankees) cropped up that the Crisconi group was underfinanced, and Johnson collared Roy Mack at Roy’s home to persuade him that his original deal was better in the long run. On October 28, the sale to the Crisconi group came up one vote short of the five needed for approval, with Roy Mack voting against the deal he’d just negotiated. A day later, Connie Mack released an open letter to A’s fans (one that was likely written by his wife) blasting the owners for sinking the deal to the Crisconi group. However, he conceded that he didn’t have enough money to run the A’s in 1955, and the Johnson deal was the only one that had any prospect of winning approval. A few days later, the Macks sold the A’s to Johnson for $3.5 million–$1.5 million for their shares plus $2 million in debt. Selling Shibe Park—which had been renamed Connie Mack Stadium a year earlier—proved more difficult, but the Phillies reluctantly bought it. The American League owners met again on November 8, and duly approved Johnson’s bid to buy the A’s. Johnson’s first act was to request permission to move to Kansas City. This proved more difficult, since it required a three-fourths majority. However, Detroit owner Spike Briggs was persuaded to change his vote, ending the A’s 54-year stay in Philadelphia.